The beautiful color combination for the DD24 is Pool Party and Soft Suede. For this card I took the hexagon trend to the max, adding a few polka dots as well. The background was done with an IO background stamp, and the pool party panel was embossed with a Sizzix Hexagon ef. The soft Suede panel was done with a SB M-Bossabilities So trendy, and the flower was stamped and hand cut using a HA image, along with a mini brad in the center. Ribbon is soft suede, and perfectly matches the card stock in spite of the photo showing it a completely different color. Sentiment is by SU! Sincere Salutations and was done with soft suede ink. Here's my card for this week's OWH Stars & Stamps challenge #142. 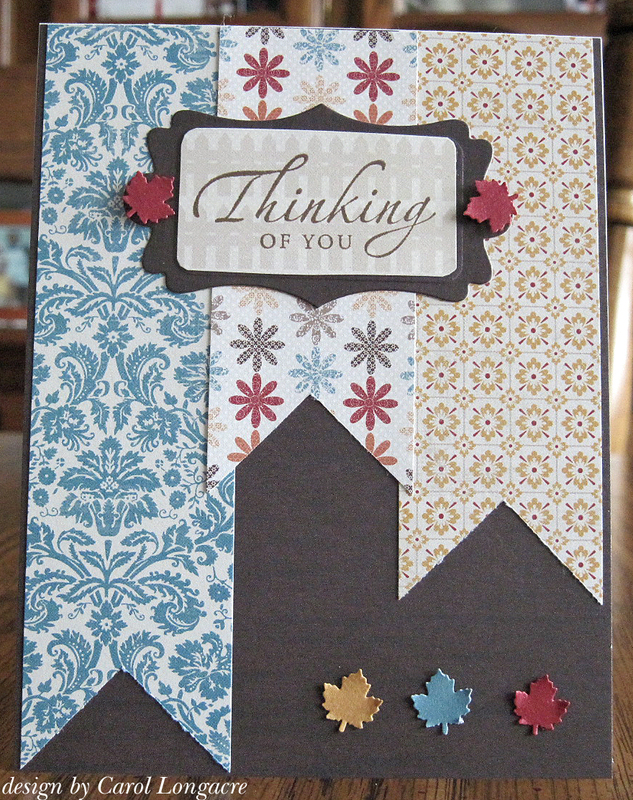 All the dsp came from the LilyBee Autumn Spice paper pad for this one, and I added a sentiment from SU! Sincere Salutations on a SB grommet tag stamped with Walnut Stain distressed ink. The leaves were done with matching scraps from my bin and an EK border punch. That's it for today, but thanks for stopping by and have yourself a wonderful day! Carol, These two cards are remarkable. I love all the hexagons on your first card and your plain and polka dotted bow. The flower with the center brad is just lovely. Your second card, I guess GMTA. 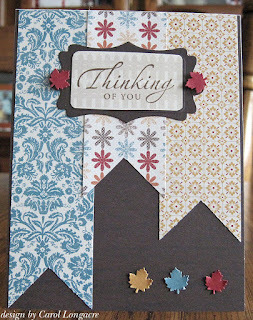 I love the muted fence on your sentiment piece and those leaves are the ideal embellishment for this time of year. Very pretty papers. Now I'm off to see how the race ended last night. I could not stay up that long. Enjoy your day. Gorgeous cards as always! Funny how you and Donna used some similar elements! tfs!!! Carol, thanks for playing along with this week's sketch. I love the addition of the leaves on your card. The top card is awesome with the variety of hexagons you used! As always, great cards...I really like the color combo, on the first card...those colors look so pretty together. I hope I find the time to make one this week for the challenge. Hope you are having a great weekend. Very cute! I love the hexagons; they are quite the rage nowadays. Your other card is cute too. Love seeing the SU products. Oh I love both of these! Your sketch card is so great! I love those teeny leaves! These are beautiful, Carol! Now I definitely want that embossing folder...! Love both of them! Really like the banners and tiny leaves in the second card - and the embossing, colors, and background stamp, in the first card! Pool party and soft suede - how does one go about getting a job thinking up great names like these for colors? I love how you coordinated all the honeycombs in the first card. I want that embossing folder too! Love your sketch card! Carol your cards are fantastic! Love all the hexagons in the first one, and those colors are very pretty. Love the patterns & colors in the banners on the second card. They go together so nicely. Beautiful cards. The top is my fav - love the flower and the great layers. The second is pretty too with the fun banners. Great projects!!!Hugz! Soft Suede isn't one of my favorite colors, but you've done it up beautifully! Oh, man, am I gonna miss another DD challenge? I love that one and your card is amazulous!! Both, actually, so's the sketch one. These cards are both very pretty! I love the colors and the brads on your sketch card! I love the textures! Don't you hate when the photo makes the colors change?! So glad to see you at Dynamic Duos! So pretty, nice mix of textures and prints. TFS! Love the colors on your first card, Carol. It's gorgeous. Wonderful pennants on the second. Nice way to do your sentiment piece with the fence. I alway love to visit your blog and see the beautiful cards you make. Both of these are fabulous with a perfect mix of color, pattern, and my fav - embossing! Lovely cards. I Like your combination of hexagon shapes and the pretty double flower. Thanks for joining us at Dynamic Duos. Lovely cards. I like you combination of hexagon shapes and the pretty double flower. Thanks for joining us at Dynamic Duos. Thank you for joining us at Dynamic Duos! 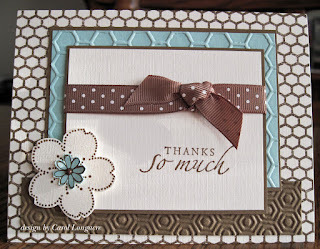 I love all the textures, patterns and layers on your lovely card!